Stockings are one of those things that many of us modern wearers learn about only as we get into vintage (or lingerie, for that matter). It's not something that most women these days wear, and a lot of my learning about stockings has been a bit through trial and error and through reading blogs. I want to share some information I've found from period sources and my own experiences. I'd love for you more experienced stocking-wearers to contribute, too! 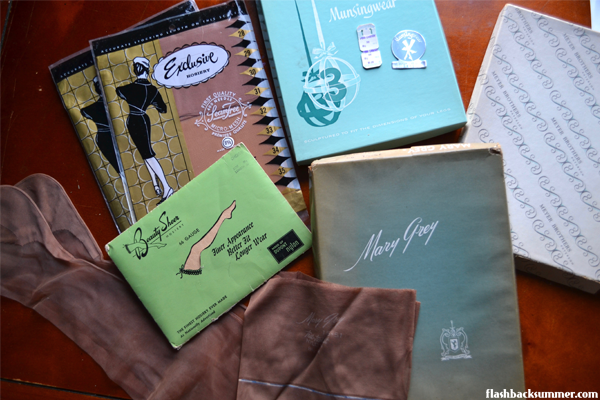 Below I have two pages of information that came with some vintage stockings I bought, and it explains a bit about the makeup of stockings and how to care for them. 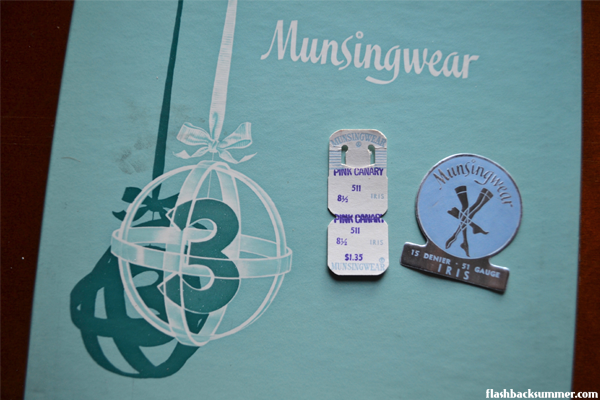 First up, some handy-dandy info from Munsingwear! As you can see here, vintage stockings are not like modern tights. There is a lot more sizing and fitting involved, since the nylon used was not as stretchy as our modern tights. 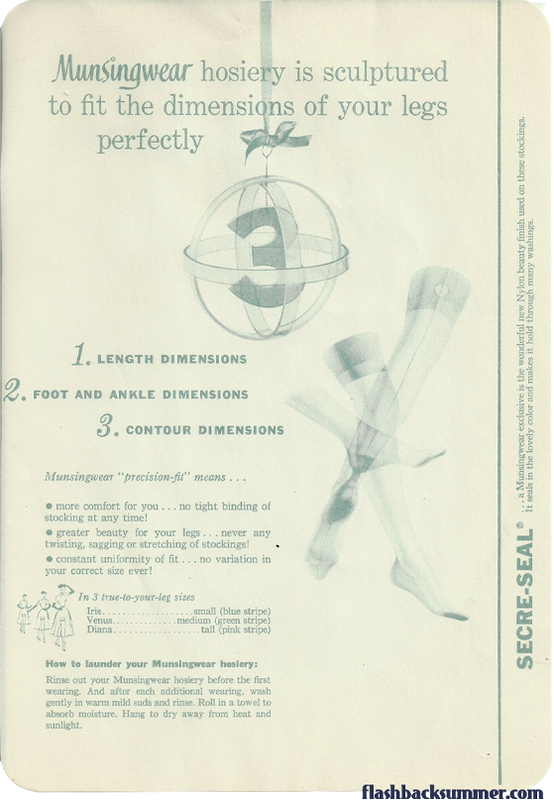 The important measurements you need to know when buying vintage stockings are top-to-heel length, heel-to-toe length, and thigh (top) circumference. These measurements should be very close to your body measurements to fit properly. However, you'll almost never find these measurements on vintage stocking labels or packaging; you'll find sizes. 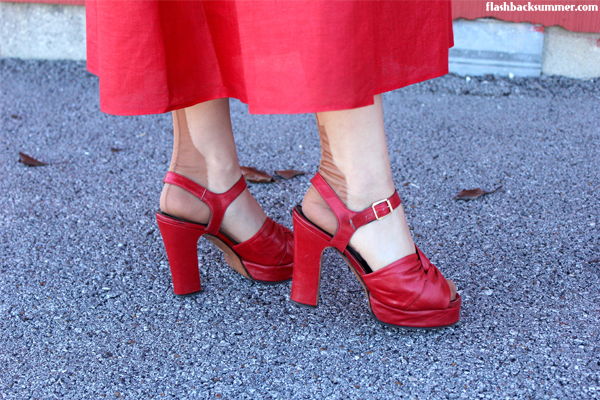 Vintage stocking sizes range from about 8 1/2 to 14, and it's based largely on foot size. Sometimes you'll find petite, regular, and tall options to account for differing leg sizes. The Nylon Swish has a really great chart to help you convert your measurements to a vintage stocking size. For me, a size 8 1/2 works alright. I've got about a 28" inseam length and a size 5US foot. I'd rather have a bit smaller, but I've never run across a size 8 petite... though I think that would be my perfect size. (If anyone's got some... let me know! I'm interested!) I have yet to find reproduction stockings that are short enough for my legs, so petite ladies beware! Keep your eyes out for vintage ones. You also want your stockings to be shorter than your inseam, obviously, because of how it will be attaching to the garter belt or girdle. You need a gap between them for the suspenders to stretch as you move. While "denier" denotes weight or thickness of the nylon yarn, "gauge" refers to the texture of the knitted fabric. High gauge stockings have a more flattering appearance and wear longer because of their fine, closely-knit fabric. As you can see in their graphics, a higher gauge number makes for a finer, more durable stocking. A higher denier makes for a more opaque stocking, and a lower denier means the stocking will be more sheer. Oftentimes ladies back in the day picked their stockings for the occasion. For work or everyday wear, they would go with a high-gauge, high-denier stocking that would be thick and durable. These are also good for cold weather. On the other hand, ladies preferred the sheerest, most natural-looking stockings for special occasions like parties or weddings. Mary Grey Nylons - For added wear and beauty, wash your nylons after each wearing. Keep finger and tonsils well manicured, and when putting on your stockings, carefully roll them first and then gently unroll them onto the foot and leg. I strongly support that last sentence; unrolling them onto the leg will prevent a lot of wear and tear on your stockings. I also take my rings off when I put stockings on. I've snagged my nylons a couple times in putting them on, and it's very devastating. Don't do it! 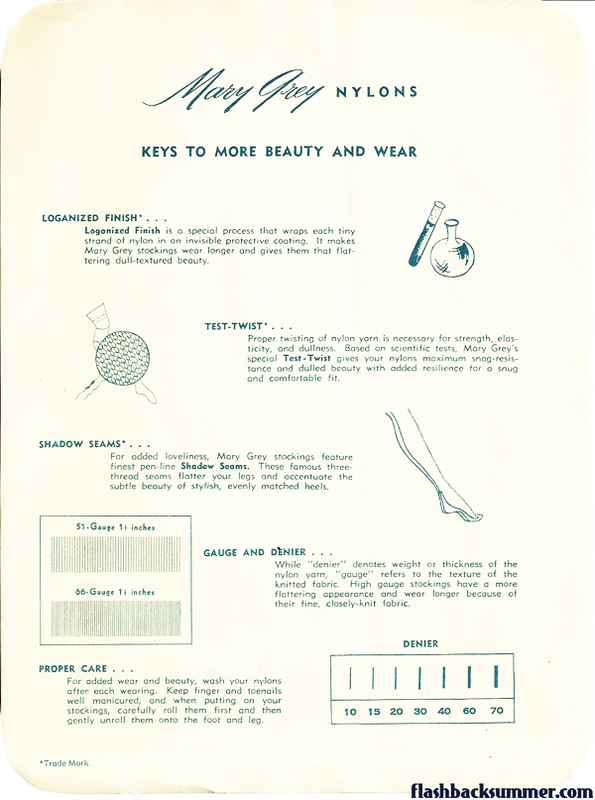 Munsingwear - Rinse out your Munsingwear hosiery before the first wearing. And after each additional wearing, wash gently in warm mild suds and rinse. Roll in a towel to absorb moisture. Hang to dry away from heat and sunlight. Always hand wash vintage nylons in some soft soap. Most of the time I use a gentle dish detergent and warm water, and it works brilliantly! DON'T ever twist or wring out your nylons. I've found it alright to ball them up and squeeze the water out then lay them flat on a towel. Rolling them in this towel squeezes out most of the water, and hanging them to dry will leave you with fresh stockings! What about you guys? What are your top tips for stocking wearing? Do you have recommendations for your favorite reproduction brand? I love the detail photo of your stockings. Very delicate and lovely. Thank you! I'm also kind of afraid of killing mine, but my vintage ones have stood up way better than the repro ones I bought. One modern pair I got had a run in them by the first day! This is great advice. I usually wear thicker styles in winter, but I had a sheer pair last year I bought for my wedding, and they go a lot of wear, unfortunately now need to replace them. Generally I find the single legs work better than the full pairs, so much easier than having to hike them up. I totally agree! The single legs of stockings are way better in some ways than tights. Definitely no sagging issues in uncomfortable areas, haha! Thanks for this post! Helped me a lot! I really love vintage stockings but have a hard time to know what size would fit me best ! I'm very glad! I hope it will help future purchasing and make for less trial and error for you! Excellent post, sweet Emileigh. It's a bit surprisingly, really, given how many of us wear them (and/or repro styles) that the ins and outs of vintage stockings aren't explored more often in the vintage world. Serious props - and thanks - for this in-depth look at the topic. *PS* I'm really glad that you mentioned your foot size here. I swear, I was thinking about you big time yesterday because I just listed a super 1920s/1930s looking pair of c. 1960s navy blue heels that I thought would look fantastic on you. They're about a size 5.5 though, so they might be too big. I remember you mentioning to keep an eye out for small sized vintage shoes, but couldn't recall if you were a 5, 5.5 or 6. Thanks for mentioning that you're a 5 here. If I come across any that are squarely a 5 I'll email or FB PM you, dear gal.